NEW SCOTLAND — You would think the center of town would actually be the physical center of town. However, the Capital District isn’t your traditional area. In New Scotland, there is only one area that’s truly zoned to be a commercial and retail area. That little area is at the intersection of Routes 85 and 85A, a perpendicular meeting of two roads that house some of the biggest businesses in town. Staples like Falvo’s Meat Market, the area’s premier destination for choice cuts, are joined by the cute and quaint Something Olde, Something New, which calls the beloved Stonewell Plaza its home. The corner was once the home of a hotel. The hotel was started by a person named John Reid in 1830. The building survived until the 1960s. “I’ve seen Stonewell Plaza grow substantially,” said New Scotland Town Historian Robert Parmenter, who has served since 1974. The plaza once housed Falvo’s before it moved to its new residence a little up Route 85A in 1974. Falvo’s owner Joe Robilotto is now selling the meat shop. Something Olde, Something New has held shop since 1997. Stonewell Plaza merges the old New Scotland with the modern, jazzy new era of fast retail and expansive development. Stonewell Plaza has had its own growth spurt. Plazas can’t have growth spurts, right? Wrong. The plaza site was a simple delicatessen and snack bar. Owned by Herb and Dexter Davis, the 1950s-era store sat sleepily on what would eventually be the town’s most populated retail center. The Davis’ must have known the potential; in 1955, they opened an Italian-style restaurant. As the plaza expanded, so did the offerings. Eventually, a grocery store joined the ranks. Soon, the Italian restaurant was gone, overtaken by the grocery store. The grocery store was then followed by its trusty sidekicks — small businesses like restaurants and retail stores. Stonewell Plaza got its name from the well that used to be out front. Now covered by a parking lot, the name serves as a reminder of simpler times. Parmenter noted that the famous corner also once held a convent training center for nuns right before the intersection headed toward Delmar, which has since been several sports bars. All have closed. That lot is now vacant. How the Stonewell Plaza looked at its inception during the 1950s. New Scotland wasn’t always its own little slice of heaven. The town broke away from Bethlehem in 1832. The first town meeting was held right across the street from the plaza site, at the since-demolished Raynsford House. Named for Edmund Raynsford, residents met on April 19, 1833 as their own town. The Raynsford House continued to serve as a town center until it burned down in 1898, when the King House was built in its place. 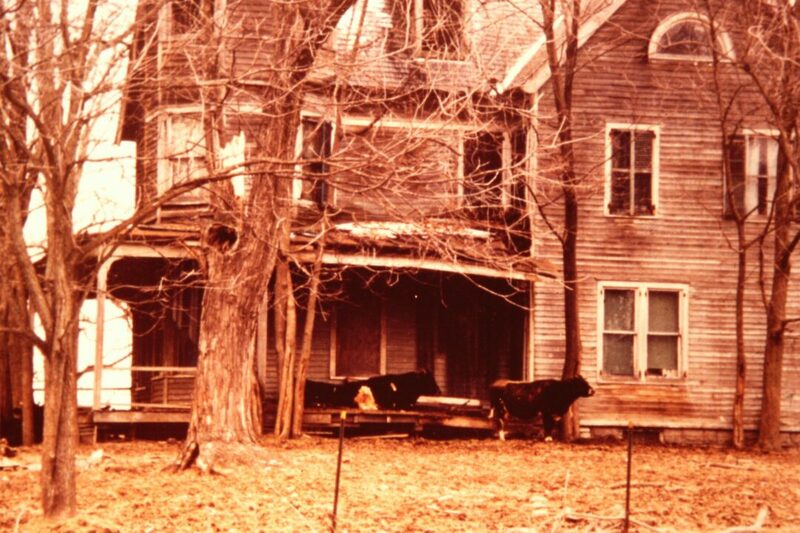 The King House is known for cows on the front porch — no, seriously. The King House was eventually torn down. The vacant lot is now green, with several trees blocking the view and shielding the excessive sunlight. Across the street from the now vacant lot where the houses once stood, an old gas station sits quietly. Believe it or not, Parmenter said this once was a hotel. Built in 1830, it was owned by John Reid until it was sold to Edmund Raynsford. The hotel also served as the town post office for quite some time. The hotel days came to an end with the help of Charles Bender, who owned the Bender Melon Farm a little past Falvo’s Meat Market. Bender has purchased the hotel as a means of necessity. At the time, his workers would drink at the hotel in excess. Getting frustrated with his help, he decided to buy out the hotel and turned it into three apartments, closing the bar. Eventually, the hotel itself was torn down in the late 60s, and the gas station was put in. The gas station is now out of business. Just a trot down 85 to the right, across from New Scotland Presbyterian Church, the town hall sits on the right side. Parmenter explained the rich history of the town’s offices. These renovations took place in 1957. Several additions have been built since then. The town hall has now stood there for 62 years. While businesses like Falvo’s, Something Olde, Something New, Studio 85 and Pizza by Dominick hold steady, Parmenter chalks the evolution of businesses up to the particular needs of each business. Much of the area around the plaza is up for sale. After the big box scare in 2010, when Sphere Development was looking to get approval to build a 750,000-square-foot retail shopping center. After significant public outcry, the plans were scrapped. Residents still have a reason to be nervous, too. In April 2016, the Hilton Barn, a 100-year-old landmark and one of the oldest barns in the Capital District, was moved due to pending development. The old barn was moved to the other side of Route 85A, nestling next to the Albany County Rail Trail. Nearly 100 residents gathered to watch the barn move. The barn used to sit on the land of the Colonie Country Club. If it wasn’t moved, the historic structure would have been demolished. Parmenter said there is no rush for development, especially if the proposals are not right for the area. Residents want the small town feeling the center intersection offers, while still having the choices that the several businesses offer. “This has always been the center of town,” Parmenter said about the intersection. The center that isn’t a center, but is highly regarded as the town’s retail metropolis.